Wow. Long-time Python community hosting favorites WebFaction just upped the memory on their low-end hosting plan to 256MB (not including OS memory) for $5.50/month. You can bump it to 512MB for another $7/month. That’s more than enough memory to comfortably run a modest Plone site, and when you combine it with WebFaction’s solid support reputation, suddenly you’ve got a fantastic low-end Plone hosting option. Nice. 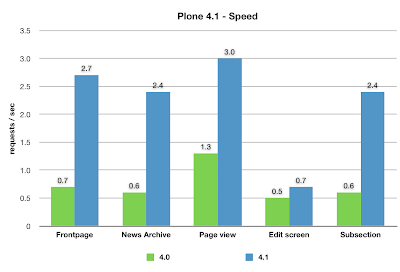 Plone 4 out of the box is already one of the fastest content management systems around. And it’s still getting faster. Malthe Borch has cut a major new release of Chameleon that gives Plone another big speed bump with almost zero effort. Chameleon is a lightning fast drop-in replacement for the Zope Page Template system that Plone (and other Python applications) use. By simply adding Chameleon to your Plone 4 buildout, you can immediately speed up your site by 20% or more, with zero code changes. The homepage of a stock Plone 4.1rc3 instance yields 13.23 pages/sec on my laptop test environment. With Chameleon added to the buildout, it jumps to 15.94 pages/sec. That’s a 15% increase. Not too shabby! In the real world, where your page templates are doing considerably more work, you should see an even bigger boost. Malthe’s been brewing this up for a while now, and it’s great to see it cross over into “ready for everyday production use.” Give it a try! Malthe’s taking bug reports if you run into any hiccups. Yiorgis has a great little video that shows this in action. Pretty magical. Long-time Plone community member Raphael Ritz just released collective.contentstats, a new little add-on for Plone that generates a simple grid view that counts up each of your Plone content objects by content type and by workflow state. In addition to the obvious function of providing a quick and easy way to track how many pieces of content you’ve got in your site, being able to quickly click through any number to get a list of the matching content objects is a tremendous simple way for site managers to zero in on draft content that might have gotten abandoned before being published, or old, retracted content that is ripe for deletion. We’re already using it on Groundwire.org, and I’m looking forward to rolling it out to Groundwire clients. Thanks, Raphael! Laurence Rowe and Martin Aspeli just made the first beta releases of Diazo and plone.app.theming. I couldn’t be more excited. 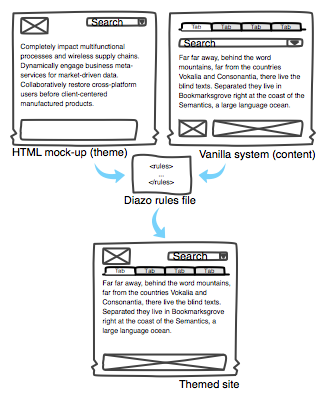 Diazo is a revolutionary new approach to theming web applications. And, while it has been developed by the Plone community, it’s not just for Plone. Diazo can be used to theme almost any web application, and I think it heralds a paradigm shift in how we think about theming websites. Diazo works best with Plone 4.1 (in beta, coming very soon), which includes its dependencies, but can also be installed in Plone 4.0.x. I can’t wait to see what folks will be able to accomplish with Diazo. With Plone 4.1 now in beta, Hanno Schlichting’s been testing it against some of his big, real-world sites, and finds that it offers a 2x-4x performance boost for sites with thousands of content objects. That’s pretty sweet. For the past couple of years, I’ve had this blog on a 256MB VPS slice at Rackspace Cloud, which, overall, has been a very nice ~$12/month experience. But I’ve chafed a bit at having to restart my Apache web server instance every so often, because it has run out of RAM. I’m just running a personal blog, goshdarnit. How can that burn up 256MB of RAM!?!? Turns out the culprit is Apache. Or, more accurately, the combination of Apache + PHP. PHP prevents Apache from running in its more memory-efficient “worker” configuration, and the result is that even a site with almost no traffic can easily run out of memory. Worse, tuning Apache to keep memory usage low means that it starts to perform really poorly. Bottom line: it’s actually really hard to run a simple WordPress (or other PHP apps) behind Apache on a virtual private server with limited memory. I’d been casting about for a solution, and had almost settled on using Ngnix, the increasingly popular open-source web server that lots of my friends in the Plone community really love. But, truth be told, I was a bit intimidated by configuring it to work with PHP, even though it’s far simpler than Apache (which I also barely understand). Then, David Bain turned me on to Cherokee. Cherokee is a new-ish open-source web server that is designed to combine the speed of Ngnix with insane ease of configuration + deployment via a user-friendly point-and-click web administration panel. And, sure enough, it didn’t disappoint. In about an hour, I was able to install Cherokee, configure PHP, point Cherokee at my WordPress instance, and migrate a few rewrite rules to handle my WordPress shortlinks. My site is now cranking out over 100 pages/second while RAM usage is well under the maximum and we’re never swapping into virtual memory. Suddenly, the WordPress editing interface feels reasonably responsive. Vroom! Looking into the future, I’m pretty excited about the potential to easily deploy Plone behind Cherokee. Cherokee has built-in, easy-to-configure uWSGI support, which means that we’ll be able to start messing with Plone 4.1 + Cherokee. (Plone 4.1 will ship with Zope 2.13, which is the first Zope 2 release to ship with unofficial WSGI support.) This will remain “experimental” for a release or two, until the community’s had time to explore & document best practices. I waxed enthusiastic about TinyMCE when it was first released as an add-on for Plone 3, and my love for it has only grown deeper with time. Our not-so-HTML-savvy clients love it, too. For the first time in its 9-year history, we’ve shipped a new default theme with Plone. It’s called Sunburst, and it’s a triumph of elegant minimalism in web design. Sunburst’s beauty is more than skin-deep. Designer (and Plone co-founder) Alex Limi is User Experience Lead for Mozilla Firefox, so he knows a thing or two about how to make the web beautiful, usable and accessible. Sunburst incorporates all of the wisdom he’s gained over the years, and a TON of usability feedback from everyday Plone users, Plone integrators and usability experts. The other great thing about Sunburst is that it’s easy to customize. We’ve stripped down the templates and the CSS, removing a lot of clutter that had crept into the default Plone templates over the years. This will make things much easier for site integrators and theme builders and sets the stage for more improvements to “through the web” theming in Plone 4.1. Plone 4 is fast, fast, fast. If there was a singular obsession of the core Plone developers during the Plone 4 release cycle, it was making Plone go faster than ever before. Hanno Schlichting was the “speed champion” for Plone 4. While most of the Plone team has been focused on building new features and refining our UI, Hanno was tinkering in the lab, doing performance profiling to figure out exactly where we were wasting precious milliseconds. Then, he dove into the code and figured out where to make exactly the right tweaks to speed things up. Hanno’s goal for Plone 5 is to boost our performance by another factor of 3 and hit 50 pages/second uncached on commodity hardware. Vroom! In olden days, Plone stored uploaded files (aka “BLOBs” — that’s Binary Large OBjects) directly in the ZODB. That was clean and simple, but unfortunately, meant that sites with massive numbers of documents & images produced bloated ZODBs that could be hard to manage. Worse, Zope used to be somewhat inefficient at serving up these big files, which could really slow down a site. There have long been add-on products for Plone such as FileSystemStorage that alleviated these problems, but these were imperfect solutions. As it turns out, the fix really lies at the level of the Zope database itself. And Plone 4 uses ZODB 3.9, part of Zope 2.12, which includes native support for filesystem storage of BLOBs and for super-efficient uploads & downloads. This is a big deal, especially for Plone-powered intranets, who will find their ZODB sizes and RAM usage dropping dramatically and user satisfaction zooming skywards. Plus, add-on product authors and themers can now count on jQuery Tools being there, letting them build even more polished and effctive user interfaces for their add-on code. For example, we’re taking advantage of it in Megaphone to make a really slick wizard for composing online advocacy letters and petitions! Plone.org’s sliding panels and accordions are all built with jQuery Tools. How Benevolent Is Your Dictator? In his article,”BDFL considered (potentially) harmful,” Steve McMahon makes some important observations about moral vs. legal authority of open-source project leaders and the importance of paying attention to the ownership of your open-source project’s trademarks and intellectual property, not just the license on the code. Worth a read. No matter when you think the scheduled release date is, it’s ready when it’s ready, and there’s not much you can do about it. Last June, I wrote up some initial thoughts about how Plone could to more to help folks with limited experience preparing images for the web. It got quite a bit of favorable response, but then I went off on sabbatical and haven’t followed up, until now. I’m more convinced than ever that this is a good idea, and I really want to build some energy and resources around it. Here’s some updated thinking on what I think could be done, both in core Plone and in a new add-on product, along with a simple wireframe and some implementation notes. Plone 4 includes a frequently-requested feature that makes images much smarter: through-the-web configurable image scales. Previously, these were hard-coded into ATContentTypes. Now, we have a new “Image Scales” control panel, and site admins can add, edit and remove image scales. This makes it much easier to provide the image scales site users need, and to eliminate the ones they don’t. Nice work! Let’s make the amount of JPEG compression that PIL applies be easily configurable. Right now, it’s hardcoded into our zope.conf, and it’s really, really high. When we prep images for the web here at Groundwire, we typically use a compression quality of 60. I think that it would make a lot of sense to expose this variable through-the-web in the Image Scales control panel configlet. Ok, now here’s where the cool stuff starts. Here are my updated thoughts on an add-on product that I think would really make life easier for sites that have lots of poorly-optimized images. Walk the site catalog, looking for all objects that are Image-ish (i.e. have an image field) and contain images that are in JPEG, PNG or GIF format. Look at the pixel dimensions and the filesize of each image. Present the user with a list of “suspiciously large” images, along with their pixel dimensions, filesize, bytes per pixel and a preview. For images with dimensions that are larger than user-specified value, offer to resize them. Apply changes via a separate process (via plone.app.async) with AJAX updates so that Zope doesn’t bog down. Afterwards, offer to rebuild Plone’s auto-resized images afterwards from this new original. Purge caches as necessary. Alec Mitchell recommended using ImageMagick, because it offers much better quality than PIL. I think this also seems sensible, because it would offer an easy way to spawn the intensive image manipulation work off into a separate process. An outside-of-Zope processing approach such as plone.app.async is probably worth looking at as a model. Resize, then convert, then compress. JPEGs should be compressed via ImageMagick. PNGs could potentially be compressed by running through OptiPNG. Use AJAX to refresh the screen on scan and as optimization proceeds. Show optimization results by crossing out weight/dimension/density and replacing with new values. (Hide unselected images when you hit Optimize.) Total up savings at the bottom when optimization is complete. Can Plone’s image scale rebuild be run in the background via plone.app.async so we don’t tie up a Zope process? Plone 4 support is required; Plone 3 support would be very nice and would probably greatly increase the value of this product. Somewhat randomly, I also wanted to take note of Kurt Bendl’s useful recipes for limiting the max KB and pixel dimensions of uploaded AT Images and Files. This might be useful and/or worth exposing in a TTW setting. Doing a mediocre job on this would probably be pretty easy, but it will take some focused effort to really nail the details that will make this sing. I think this is a project worth raising a little bit of money around, and hiring someone good to really own it. If your clients would benefit from a tool like this, I encourage you to think about whether you can raise some cash from them for a bounty fund. I don’t have a hard total in mind just yet, but I’m thinking that $3000-$5000 might be a reasonable range. I’ve got a couple of people in mind that I’d like to approach as possible developers on this, but if this description strikes a chord with you and you’ve got both the passion and skills, let me know! I’m willing to PM this and be “the customer” and Groundwire can very likely help seed the bounty fund as well. Let’s make this happen! Shortly before dashing out the door for Pycon 2010, David Glick pushed out a 1.0 release of Popup Forms for Plone, which he and Steve McMahon built on top of Steve’s excellent Pipbox and PloneFormGen products. Popup Forms are great for email capture forms, action alerts, user surveys, and many other calls-to-action. If that’s what you need in your Plone site, I encourage you to check it out!